Orchid Print are specialist lithographic printers. This project needed to reflect the high quality and detail of their work. 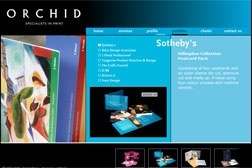 The challenge was to create a site which appealed to their clients in the industry, which happen to be designers! By using a combination of macro photography, to capture the detail in the printing & the use of Flash, to allow smooth navigation and pre-loaded images, the site offers visitors with a smooth experience.